Record Store Day website now has a split cassette by Frightened Rabbit and Twilight Sad listed. I’ve heard they cover each others songs but hopefully I’ll get more news on that and how many there will be etc tomorrow from the label. Always dubious about any awards but was at least interested to see who the “winners” were. Sure it was last Friday but checking google, tweets and even the website ! comes up with no mention at all of the winners. Started to think I’d imagined it confirming I finally had lost the plot but website definitely says Friday 25th February. Very strange indeed ! We will now be open every Sunday for those of you who fancy a leisurely stroll through the Grassmarket and a browse. Chaffinch brought in more of their excellent sampler CD for the Burnt Island in-store yesterday which is a mere £1.99 or free when you buy any three releases on the label. Album club members should note this will be part of our latest package due to be announced this week. Panicked when only two arrived with the new Bonnie Prince Billy ten inch but then another box arrived later so all was well. For those who asked if we would be matching the Amazon price of £49.99 the answer is that we are £10 cheaper @ £39.99. Really looking forward to this as I’ve never managed to catch them live before. Our best selling EP of last year or a top ten album depending where you stand on the 6 track mini album / EP. We will have the last few copies for sale along with the rest of the Chaffinch catalogue. Anyone in the shop tomorrow can try to make a quick £50 by taking part in the Day V Lately competition from Yell. Funnier however will be the Menswe@r ad in which Johnny Dean tries to track down his classic first single “I’ll Manage Somehow” (1995 – #49). We have a great selection of seven inches and CDs on the Chaffinch label this week. We also have a cracking sampler CD available for £1.99 or free when you buy any three label releases. The week will of course culminate in the Burnt Island in-store on Saturday. More news to follow. Thanks to everybody who made our first Sunday opening of the year a big success. 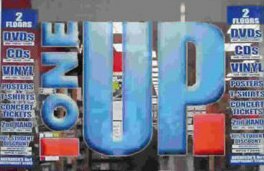 There has been a lot of comment about One Up laying off two staff this weekend virtually all supportive of the shop and even the few more negative comments are along the lines of it being “inevitable”. Avalanche and One Up are not identical but we are similar. At our core we have a large loyal customer base, we support local and Scottish music in general and even in these hard times do our best to support all independent music. One Up get to sell more tickets than Avalanche and luckily for them don’t have an HMV financed FOPP to compete with. On the other hand being based in Edinburgh we get more tourists and have a bigger music scene. While downloads and VAT dodging online sellers don’t help the lifeblood of independent shops are the fans of bands. I can only speak for Avalanche but I think it is fair to say that would be true of most of the bigger independents that are left. If shops are to survive it has to be with the support of bands and their labels. If bands and labels do everything they can to make every last sale to their fans at the expense of shops then shops will indeed all eventually close. A band like Muse who admit that in the early days they were supported by independents with in-stores think nothing now of having 30,000 limited box sets and selling them directly to the fans. Radiohead who constantly asked for and were given support after “Pablo Honey” now say they have no responsibility to retail. This you have to kind of expect. However the issue is that so many bands and labels now think that shops are fair game. They collect their fans’ email addresses, they target them every time there is a new release offering them things early or with extras and bands think nothing of having an album launch before the album is officially out and selling it at the gig. When sales start to dry up then shops are approached to see what we can do to help. Bands with say a fan base of 500 but finding it hard to get any bigger will then look to shops for more sales and exposure. More amazingly come their next release they will still expect to sell to those 500 fans directly and expect the shops to pick up any crumbs that are left. At Avalanche we have been very lucky to have been supported by some of the bigger bands and labels such as Ballboy and Fence. Kid Canaveral brought in their album two days before their album launch so fans could buy it in advance of the gig and as you will know it did them no harm at all being our best selling album of the year. When the Scottish Enlightenment album started leaking out the week before the official release the band rushed over with some for the shop and again it has proved one of our best sellers. Others annoyingly do limited runs of singles and “see no reason” to give them to shops but will appear with their album asking if we will sell it. There are many limitations to selling music online. After the initial surge of publicity, reviews, gigs etc bands then often find things go very quiet. If a release is supported by a shop it is visible every day of the week and more importantly if it continues to be played in the shop customers will hear it who would never have discovered it any other way. Dan from Withered Hand will testify to the fact we are still selling his album regularly over a year after it came out. Now even that doesn’t work out too well for shops these days. We regularly have people come to the counter asking what we are playing but then instead of buying it merely write down the name of the band and say they will go away and listen to more. Good for the band’s profile but not so good for the shop. Others will take a photo of the album with their phone. A few people will even comment that they will buy it directly from the band/label as if none of the money from a shop sale filters back to the band. Ask Matthew @ Song by Toad how much cash I’ve handed over and you would be surprised by the answer. Album Club sales for The Last Battle helped finance the repress of the album. Support your local record shop and you are supporting your local bands and labels. It is a win-win situation. Of course bands will sell online and cover the many areas that no longer have an independent record shop to go to. It will give them sales abroad they would never achieve any other way. At Avalanche all we ask is that we receive ALL of a band’s releases for sale at the same time and at the same price and that it is publicised that we are stocking the releases. In fairness to the many labels and bands that do support us and I have mentioned only a few here we can not allow others just to pick and choose when they will “allow” us to sell their releases. We now sell more Emily Scott than PJ Harvey, more Conquering Animal Sound than Mogwai and we will sell more Son(s) when it is released than Bright Eyes that much has become clear this week. So if you live in or near Aberdeen and you want to see a great selection of Scottish bands’ music pay One Up a visit next week. If you still have a local record shop go in and let them know that you will support them if they stock more Scottish bands. So many bands now don’t have official distribution that for a shop to say go to all the trouble of contacting 17 seconds The Last Battle’s label and asking for stock they need to know that there will be a demand. Record shops are for all year not just for Record Store Day. You are currently browsing the avalanche records blog archives for February, 2011.